CPAP therapy patients do not have to feel uncomfortable or frustrated anymore because of therapy with bulky/heavy machines and oversized masks. Today’s CPAP machines are chic, advanced medical devices which focus on giving the patient maximum comfort during therapy. Patients can also regain their freedom of mobility fully thanks to powerful batteries that can offer up to 25 or more hours of CPAP running time anywhere, anytime! The C-100 Battery Pack works with all models and makes of CPAP therapy machines, but also Bi-Level therapy devices. The greatest advantage of the C-100 Battery pack is that it does not have to be fully discharged before patients can start charging it. This further gives peace of mind that you can have with you anytime a fully charged battery, offering you maximum backup! *If you purchase a separate Sine Wave Inverter compatible with your battery pack, it can be charged easy and quick via the cigarette lighter socket of a vehicle. The C-100 CPAP Battery pack is fully protected from overheating or thermal runaway. Don’t Let Your CPAP Machine Keep you From Enjoying Life to the Fullest. The C-100 CPAP battery pack is the best possible accessory for active patients, frequent travelers, campers, RV road trip aficionados…the battery will ensure that you can get required CPAP therapy anytime, while on the go! C-100 Battery is a multipurpose tool- the battery can be used to charge any other external devices including a portable DVD player, your iPod, your cell phone, or iPad. Lightweight battery- only 1.65 lbs. When placing your order with SleepRestfully for a C-100 CPAP Battery Pack you can choose between purchasing one battery, or Two Batteries & Pig Tail. Dimensions (L x W x H): 7.5" x 4.25" x 0.75"
C 100 Light Weight Super CPAP Battery Kit Discounts Apply ! Power your CPAP or BiPAP machine when and where you need it. Perfect for camping, airline travel (FAA compliant) and use during power outages. Compatible with Respironics M series, Respironics System One series and DeVilbiss IntelliPAP series PAP devices. Power connection components are available which allow the C-100 CPAP Battery to power other makes and models of PAP devices. Lasts 1-3 nights (without the use of heated humidification or heated tubing) before needing to be charged and charges to full capacity in 4-5 hours. 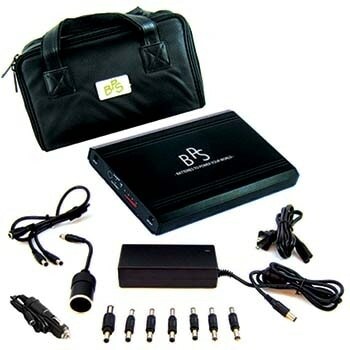 Kit Includes: Carrying case, C-100 CPAP Battery, AC power supply, DC power pigtail cord, connector tips, DC input cord, and product manual. The C-100 CPAP Battery gives you the freedom to power your CPAP or BiPAP machine no matter where your world takes you! Weighing less than 2 lbs. the CPAP Battery comes in a convenient carrying case for ease of travel and it meets requirements for lithium-ion batteries taken in carry-on baggage during air travel. It’s the perfect solution for outdoor enthusiasts, those that love to travel both near and abroad and for use as an emergency power backup during power outages. You can also power other small electronic devices that operate from 12V by using the electronic device’s DC power cord and the DC input cord included with the CPAP Battery Kit. The CPAP Battery will power Respironics M series, Respironics System One series and DeVilbiss IntelliPAP series PAP devices for 1-3 nights before needing to be charged. Carrying case, C-100 CPAP Battery, AC power supply, DC power pigtail cord, connector tips, DC input cord, and product manual. 1 year manufacturer warranty.